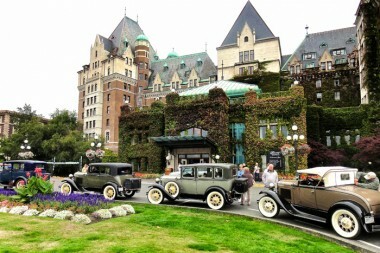 Imagine my surprise as I’m exploring the streets of Victoria on foot when I come upon this scene – a collection of restored late 1920’s Model A Fords lined up on the circle drive in front of the Fairmont Empress Hotel (established in 1908). I capture this impression from a bygone era as a Model A club gathers to begin a two-week 2500 mile tour of British Columbia. One of a set of two.